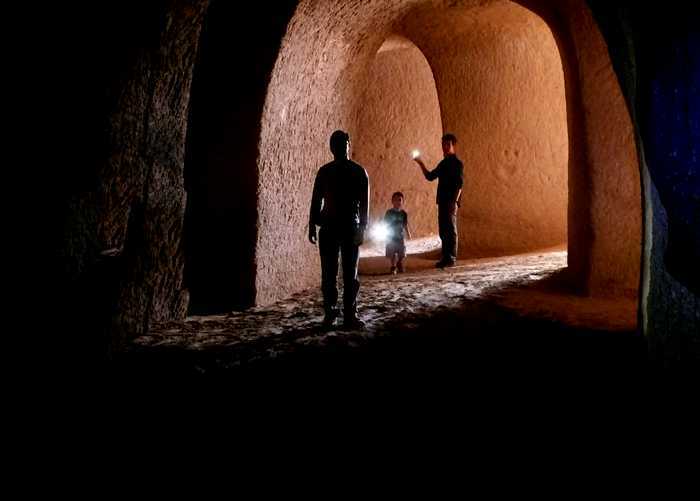 Exploring Major Navarro’s Subterranean “Church Made of Sand” in Villa Corona. I recently spent a morning on the beach at Atotonilco Lagoon learning all about the plight of a tiny waterbird called the Snowy Plover. When the biologists and bird watchers involved in this Save the Chorlito project finally got hungry, off we all went to an excellent restaurant (El Pollazo, Avenida López Mateos 178) in the nearby town of Villa Corona. Well, on our website, Ranchopint.com, I put updates to places described in our books, and a few years ago I regretfully had to announce that I had found Puerto de Lourdes locked up tight and closed to the public. However, everyone in this optimistic crowd decided it was nevertheless worth checking out. “I still remember the way,” said my good friend Jesús Chuy Moreno, who—about 27 years ago—had helped our caving club catch vampire bats deep inside the labyrinth of tunnels hand-carved by Major Jesús Navarro. 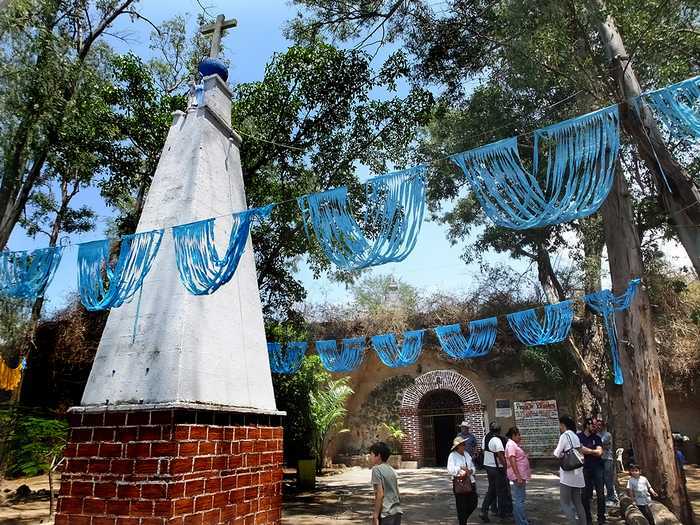 The Major, a veteran of the Mexican revolution, always claimed the Virgin had come to him in a vision in 1939 and had asked him to build a chapel inside a hill on the outskirts of Villa Corona. This might have seemed a daunting task to most men, but Major Navarro, having discovered that the hill was made of soft jal (volcanic ash and pumice), took to his assigned task like a mole, tunneling through the soft rock—which he referred to as sand—every which way, perhaps waiting for a divine sign as to exactly where the chapel should be located. Let me point out that we are not talking about Chapo-Guzman-style tunnels, here. Major Navarro was a perfectionist and each of his roomy passages comes with a beautifully arched roof, high and wide enough to accommodate a city bus. More information about this unusual place comes from TV reporter Ahtziri Cárdenas who interviewed the Major in 2008. “Some people think these caves were made by nature,” said Navarro, “but no, they were carved out of the earth by pure hard work and lots of sweat, day after day.” Here I should mention that the Major said the same thing to me, years ago, and I always wondered how one man could have done so much all by himself. Only later did one of his sons tell me “No, no, all of us children were digging too!” And there were plenty of children: twelve or fifteen depending on who you ask. In the interview, the Major goes on to say that his dream church became a reality in 1959 and that it was even visited (in 1963) by President Lázaro Cárdenas. “I had done all this digging for years, but always without authorization,” said Navarro, “and then ex-Presidente Cárdenas showed up and gave me permission. 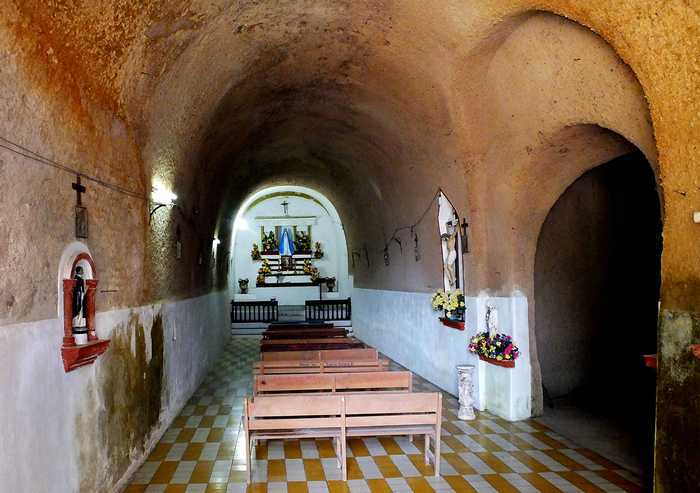 He said, ‘This place is yours and nobody is going to take it away from you.’” At that time the chapel was called La Capilla de las Cuevas, but the former Mexican president suggested that Navarro give it a name related to Lourdes, which, in those days, was very popular among Catholics. The assurance of President Cárdenas was of great importance because Mexican law only allows people to own the surface of their property. Anything below the surface belongs to the government which could, for example, rent out the space to a mining company. Now it is Major Navarro's grandchildren who have taken charge of the project and they told me they are happy to receive visitors every day of the year (see schedule below). Just be aware of one thing: Entering the chapel is quite safe, but the other tunnels are now home to lots of insect-eating bats whose guano, unfortunately, may host a fungus called Histoplasma capsulatum. Should you breathe in the spores of the fungus, you may end up with histoplasmosis, a lung condition that seems to affect people in different ways and in some cases may prove fatal. However, before getting too worried, note that a dozen of us, including several children, wandered about in the tunnels for half an hour and of these not one contracted histo. So, if you are in the neighborhood of Villa Corona, you may want to visit Puerto de Lourdes, which is now open daily from 4:00 to 8:00 PM and 10:00 AM to 8:00 PM Sundays. There is no fixed fee, but whatever you would like to donate will be gratefully received by one of Major Navarro’s grandchildren. Take highway 54 south from Guadalajara, heading for Colima, and then get onto highway 80 which goes to Acatlán and Barra de Navidad. Drive northwest into Villa Corona on Avenida López Mateos. Get onto the “lateral” and take any street northeast a block or two until you hit Avenida Rafael Madrigal Vázquez. Follow this street northwest until it meets Lázaro Cárdenas. Turn right onto Lázaro Cárdenas and go east 690 meters to the gate of Puerto de Lourdes (N20.41879 W103.65569). Driving time from Guadalajara: about one hour. This obelisk shows how high the level of earth was here, before excavation.